This morning, a story on Wired was published, and it might have you believe some sort of zombie Commodore is building a Commodore-inspired smartphone called the PET, which sounds kind of cool (I guess?). Well, here's the thing: I'm not going to say Wired got duped - but they also seem to have missed some pretty glaring red flags about this device that should probably make anyone think twice before getting excited. In particular, I'm guessing this Commodore phone has about as much to do with Commodore as that Energizer phone earlier this year had to do with the company that makes batteries. So, how does a random smartphone company from the UK (but that is clearly physically based in Italy - all their coverage has been from Italy to date) suddenly pop up with a Commodore smartphone even though Commodore as a company is as dead as all of our childhood goldfish combined? Licensing! It seems extraordinarily likely that the creditors who won the rights to the Commodore name (a name not without value, to be sure) are now cashing in on that asset, as tends to happen when you're the owner of a "zombie" trademark. Remember, trademarks aren't an unconditional form of intellectual property in the US, where the binding legal dispute over Commodore took place - you've got to use them or lose them. Licensing is one form of utilizing a trademark legitimately, and though it does carry the risk of dilution (and thus devaluation), "zombie" trademarks like Commodore have few other options to extract cash from their names. One very easy way to "revive" a consumer electronics brand is to just slap it on some generic, white-label product with a custom enclosure and maybe an extra feature or two and call it a day. This is exactly what the Commodore PET phone appears to be. It has a 5.5" 1080p IPS OGS display with Gorilla Glass 3, 2 or 3GB of RAM, 16 or 32GB of storage, a 13MP rear camera, 8MP front, and a 3000mAh battery. It claims to run on Android 5.0. The octacore MediaTek MT6752 chipset in the Commodore PET is something of a clue, too - it is used extensively in no-name budget-brand and custom-label smartphones created by companies in China. Alibaba lists over 400 results for MT6752 dual-SIM devices with 1080p IPS displays greater than 5" in size. 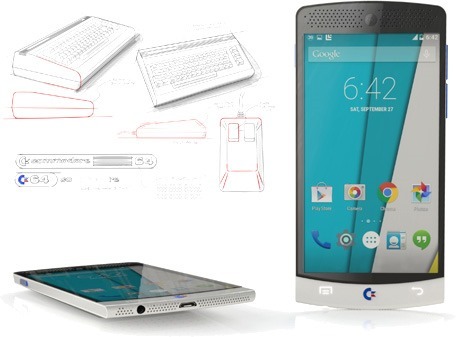 Suffice it to say, the MT6752 and a 5-6" 1080p screen is an extremely common phone configuration and suggests the Commodore is likely a "custom label" product. It's worth noting that this particular MediaTek chipset is notorious for its low upgrade rate to Lollipop, and while Commodore says the device will run Android 5.0, MediaTek's policies around open source and update support for its products have long been quite poor. While it's not a blatant physical match to any device I could find, custom case designs and button layouts are not difficult features to request - they just cost more money. 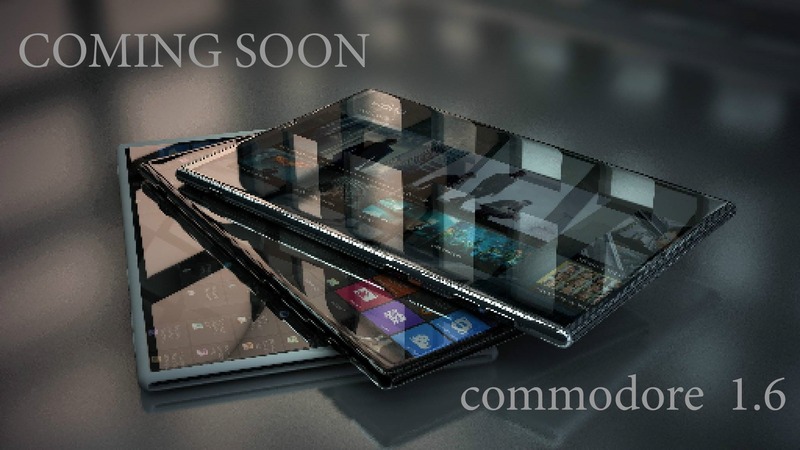 As far as specifications, it is quite similar to the Elephone ECOO E04. And, really, I can't say I would trust the company that appears to have made this video to be a serious smartphone design house. They've also used obviously fan-made concept renders on their own website and social channels in the past, and I really have no earthly idea why. Wired's article proclaims that the phone's possession of extremely basic gesture features (shake, flip, or wave to do something, like hang up the phone) are somehow noteworthy "custom functions." This kind of thing has been shipping on many Android devices literally for years now, and it pains me to see that "and of course there will be a guest mode" was somehow a notable feature that was extracted from Wired's time with the device. I just don't get the feeling the person writing this was terribly familiar with Android phones, and I don't mean that to be a pot-shot - the piece just really comes off that way. The article goes on to say that one of the PET phone's great Commodore shout-outs / features will be built-in "customized" emulators for Commodore 64 and Amiga... which were of course unavailable for demonstration. Both of the open-source apps they plan to base the "custom versions" on are readily available in the Play Store right now, for free. I reached out to the developer of both apps to see if the Commodore PET team had been in contact with them, and they've confirmed they have, and had prepared "special versions" of the emulators with Commodore's logos (sounds very custom to me!). Oddly, Commodore's own Facebook page says they're using Frodo C64 as the official Commodore 64 emulator for the device, but clearly that's not what they told Wired (they stated they'd use the VICE emulator). Commodore's new handlers claim that they're partnering with game studios to re-release C64 and Amiga titles for the device, but decline to state which studios (of those that survive to this day, which are presumably not many), games, or how many such titles it expects to release. Perhaps the only surprise is that it doesn't appear the Commodore PET will be crowdfunded. At least, there aren't any mentions of it. The company expects it to go on sale for around $300 for a 16GB storage/2GB RAM version and around $365 for a 32GB/3GB RAM version. 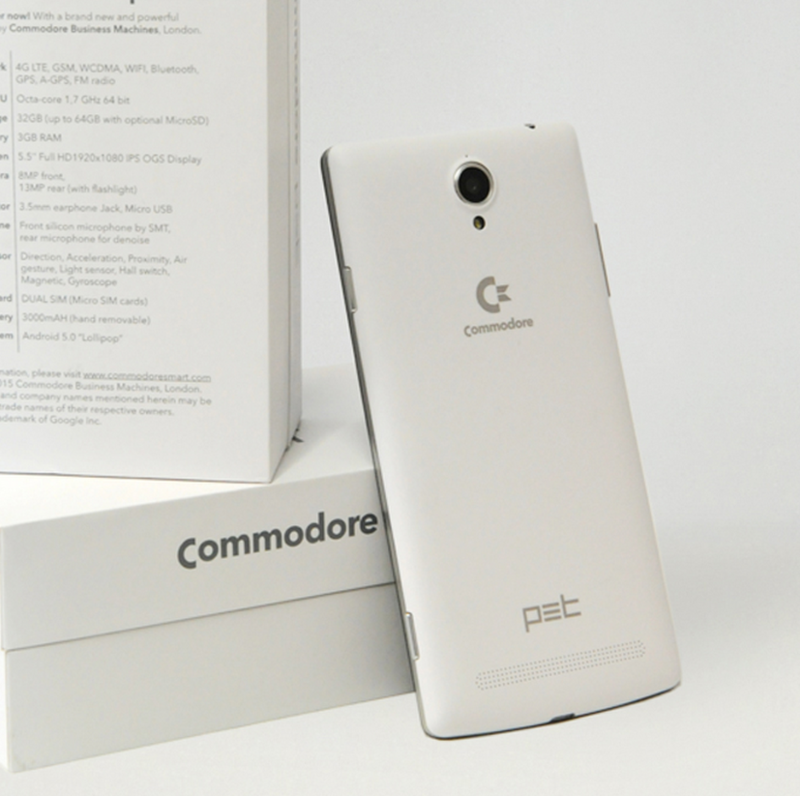 The phone will launch in Italy, France, and Poland, and Commodore claims there are plans to expand that to America "in the near future." 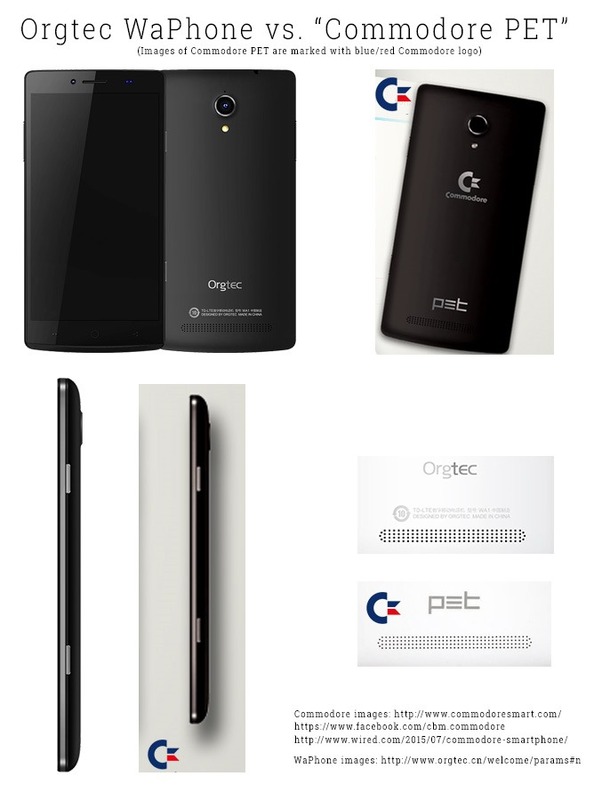 Thanks to one of our commenters, we've discovered that the Commdore PET is almost certainly a trademark-stamped version of the Orgtec WaPhone, as shown in the graphic below. It's pretty much a dead-on match - the button layout, the speaker grille pattern on the back, the camera module, and even the specifications all match up (though the WaPhone is only offered in 16GB/2GB configuration). So, if you want a way marked-up version of the WaPhone (it costs the equivalent of just $144 (¥897) for the 16GB/2GB RAM version in China), get your wallet ready.